January 2019 is a significant month in the annals of the Singapore Symphony Orchestra. 24th January marks the 40th anniversary of their very first public concert, while the 26th January sees the Orchestra’s Music Director, Lan Shu, presenting his final concert after 22 years in the post. The first of these is, of course, a matter of considerable celebration, and the second is tinged with regret, but both events prompt me to look forward and suggest some of the issues facing the Orchestra if it is to survive and flourish over another 40 years. The story of how the Singapore Symphony Orchestra came into being is well-known. In 1973 the then Deputy Prime-Minister, Dr Goh Keng Swee, gave a speech in which he famously declared that it was a “scandal” that Singapore did not have a symphony orchestra of its own, and went on to claim; “The Singapore government believes that there is more to life than making money, and an orchestra would be worthwhile as it would raise the standard of culture of Singaporeans”. Of course, Goh’s use of the word “scandal” (even if modified by the word “minor”) has caused much comment over the years, but many seem to have forgotten the historical context in which Goh was speaking. Since breaking out on its own from Malaysia in 1965, Singapore had been engaged in the single-minded pursuit of creating an identify and forging a unique character. The obstacles facing it were immense; a tiny land mass, no natural resources (including water) and a population comprising almost entirely immigrants most of whom felt more allegiance to their country of ancestry than the place where they happened to live and work. In the eyes of the international community, Singapore had become something of a laughing stock as it engaged in what appeared to be the headlong destruction of its heritage in its clamour to position itself as a global haven for absorbing and generating money. The briefing I had before coming to work in Singapore for the first time in the mid-1980s was that it was a place which not only had no culture but treated its people only as pawns in the game of making money. Health care, social benefits, cultural activities and efforts to create some sense of national identity and unity (beyond a shared interest in amassing wealth) were not, I was told, part of the Government’s strategy, and although I was coming to Singapore as a music examiner, I should expect a pretty desultory musical landscape. Lots of children did music exams but only to feed the competitive obsession which, so I understood, was positively encouraged by the government. I was told that there was a professional orchestra, but both those briefing me and those who had been here previously, assured me it was “pretty dreadful”. These briefings may not have been particularly correct or fair, but they reflected what was then a pretty universal global view of Singapore. In a bid to shake off that international perception, Goh made his speech in 1973. Yet it was another five years before it yielded any real concrete results; a delay which would have been inconceivable had the intention been to build a new bank or create a new financial hub. So I am tempted to conclude that the creation of the Singapore Symphony Orchestra was not really done to satisfy a domestic need, but to make a political statement on the world stage. And the fact that within a year of its creation the Orchestra undertook its first foreign tour, and has continued to tour internationally to an extent no equivalent symphony orchestra in the world has ever done, underlines that sense that the Singapore Symphony Orchestra’s politico-ambassadorial function is as important (if not more so) as its domestic artistic one. But whether or not one believes that the Singapore Symphony Orchestra was created for external political reasons or for internal artistic ones, the fact is that it has now become a major artistic force not just in Singapore, where it remains the only truly professional orchestra (despite the specious claims of others), but in the region, where it stands as one of Asia’s finer symphony orchestras. I cannot recall whether my first experience of hearing the Singapore Symphony Orchestra live was in 1985 or 1987, but I can recall that it was a pretty desultory one. The programmes were ambitious beyond the scope of most of the players and the conductor (the first Musical Director, Choo Hoey, faced an uphill struggle to overcome a very variable level of musical talent both within his players and himself), and it seemed impossible to inspire an audience who seemed to see orchestral concerts as social events with indifferent musical accompaniment. Unquestionably, however, Choo Hoey did a wonderful job in keeping the orchestra going in the face of often unhelpful and destructive official and unofficial “support”, and his replacement in 1997 by a man almost wholly unknown to the musical community outside China, did not seem to augur well. But there was something else on the horizon which was to project both Lan Shui and the Singapore Symphony Orchestra into an orbit of musical brilliance which nobody could ever have foreseen during the 1980s. 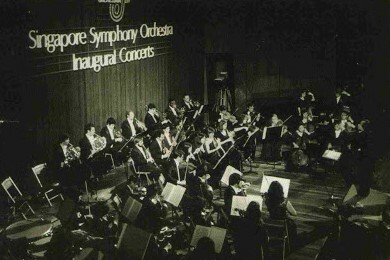 Within the first decade of the 21st century, the Singapore Symphony Orchestra transformed itself into an outstanding orchestra in its own right, attracting an enthusiastic a dedicated following at home and prompting some pretty extravagant reviews from certain members of the world’s press – reviews, which in the main, were fully justified. People often regard a symphony orchestra as a kind of musical island, solely responsible for its own successes or failures. But that is not the reality of the situation, and the Singapore Symphony Orchestra has faced and will face issues which, by itself, it cannot resolve. Certainly the change of Music Director in 1997 coincided with a huge transformation in status, moving it from a small provincial orchestra with limited appeal domestically and regarded by many outside observers as a slightly ridiculous orchestra trying hard to punch well above its weight, into a highly credible ensemble well able to hold its own on the biggest international stages. But that transformation was brought about, not by Lan Shui, but by the 2002 move into the Esplanade, with its wonderful purpose-built facilities, its enticing musical acoustics and its international-standard performing environment. Such a top-class performing home served to raise the orchestra's profile at home and abroad, allowed it to broaden its repertory, and attracted players of a calibre who might not have felt that the Victoria Concert Hall and its cramped, dated and un-musical environment offered much inducement for their future careers. More importantly, the Esplanade attracted a larger audience than had ever been able to attend VCH concerts, and the larger audience as well as the higher profile the orchestra was attaining, was the major factor in increasing standards. Lan Shui was, certainly, the right man at the right time to capitalise on this sudden physical change in the musical landscape of Singapore, and he has clearly raised the playing standards of the orchestra phenomenally. He has done so by focusing on big late19th/early 20th century repertory - significantly, his final concert this month will be a performance of one of the iconic works of the great Romantic repertory, Mahler’s Second Symphony - and many might argue that both in the recording studio and on international tours, Shui has reached his (and his orchestra’s) zenith, in performances of Rachmaninov. This concentration on a relatively small, if high-profile, part of the repertory does, however, cause problems. Outside the big works of the late 19th and early 20th century, the Singapore Symphony Orchestra often seems uneasy. A concert earlier this month when they performed the music of Steve Reich was notable for the complete lack of sympathy the orchestra showed for this repertory (“they just could not seem to get into the groove”, was the comment of one of my colleagues), while the foundations of orchestral repertory - Haydn, Mozart, et al - do not feature prominently in the orchestra’s schedule and when they are performed, usually come across as lacklustre and undistinguished. This gives the orchestra a slight sense of musical instability; they easily scale high mountains, but can't till the fields or nurture the orchards, and fight shy of exploring new territories. On top of that, increasing ventures into the world of locally-sourced new music too often ignore musical standards in the interests of domestic appeal. Specialised concerts of old or new music usually see the Singapore Symphony Orchestra revert to the kind of playing levels more akin to their 1980s persona than their 2010s one. As a result, I see the orchestra as having entered a period of stagnation, where it produces world-class performances of big, romantic music but wobbles once it moves out of this repertory. The change of music director will not in itself solve this problem, and there is no major new performance venue on the horizon which might goad them into refreshing their musical outlook. If the Singapore Symphony Orchestra wants to break out from this period of stagnation and produce consistently world-class performances at home and abroad, there needs to be a change of mind-set in its audience and management. Much as he loved music, the late Mr Lee Kuan Yew did the Singapore Symphony Orchestra no favours in some of his utterances, and helped give root to a common perception amongst Singaporeans that classical music is an alien culture. This is not true, but many believe it is and regard the Singapore Symphony Orchestra as a foreign body importing a foreign art form. This creates a certain barrier between the audience and the orchestra. Classical music supporters in Singapore (which includes much of the orchestral management) are enthusiasts for music rather than hard-nosed music professionals. They listen to the great orchestras and musicians on record, flock to performances when big names appear, and enjoy spectacular orchestral showpieces rather than the kind of orchestral bread-and-butter which truly tests an orchestra's ability to communicate with its audience. For them an orchestra is great if it does a Mahler Symphony; but they ignore one that plays Haydn. Until such time as the Singapore audience can be more musically-open-minded and educated, there will be no incentive for the Singapore Symphony Orchestra to move on. This, perhaps, is the greatest challenge facing the incoming music director. His or her energies need to be channelled not in improving the orchestra (which, certainly on a good day, needs very little improvement) but in improving the audience; not numerically but mentally. There needs to be active engagement with education. Not the token gestures afforded by random (and, on occasions I fear, cringe-makingly bad) pre-concert talks and cut-and-paste programme notes, nor the occasional schools’ concerts which aim not to educate, but to show how much “fun” there is in classical music. There needs to be a consolidated attempt to address the omissions in the current music education scene in Singapore, where music teachers rarely teach proper listening skills (not the silly aural tests of graded music exams, which serve no purpose whatsoever, but proper, systematic training in critical listening) and where the physical act of making music is taught without adequate reference to its aural and intellectual aspects. Social, religious and political context needs to be taught so that audiences can contextualise the music they hear and not merely accept it as a kind of therapeutic noise. An educated and aware audience recognises that the greatest benefits to be drawn from an orchestral concert are intellectual, emotional and sensual in equal proportion. If we look at Hong Kong, where an orchestra of similar age (45 this year) has progressed and continues to progress into one of the finest orchestras in Asia, we see huge numbers of similarities but one key difference. The Hong Kong audience is highly critical, musically savvy and cerebral while the Singapore audience remains fixated on spectacle and superficial display. In Singapore we teach music students how to play instruments, sing, pass exams and win competitions, but we don't teach them how to appreciate music as a purely aural activity. It is up to the incoming Music Director to help find a way of solving this issue and building up an audience of educated, musically literate and critically aware listeners to support the orchestra. If that is not done, I do not see them progressing much beyond where they are now. So happy birthday Singapore Symphony Orchestra, may you have decades of musical excellence ahead of you. And in bidding farewell to one Musical Director, I praise him for his incredible achievements in transforming the orchestra into the enviable force it is today and in leaving it in such excellent health. Now, though, is not the time to rest on laurels, but to address those issues which have not hitherto seriously been addressed. To paraphrase Dr Goh, it is something of scandal that such an excellent orchestra does not yet have the domestic audience it truly deserves.